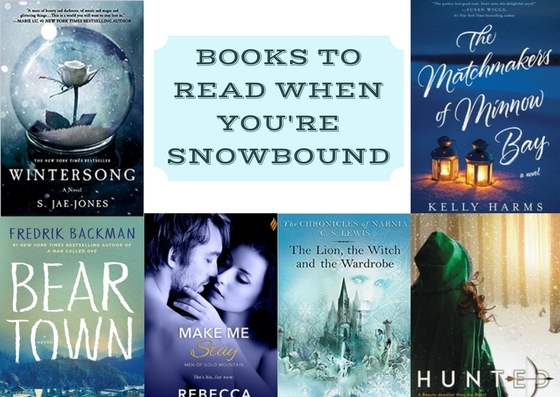 I love chatting about books, especially over on Instagram, and someone there recently asked me for recommendations for non-Christmasy winter reads. Challenge accepted! Here are six that I've either read and loved or have on my TBR pile at home. Beartown by Fredrik Backman - This novel about a small town hockey team was one of the most powerful novels I have read in a long time. If you have already read Beartown, preorder the sequel, Us Against You. It's out in June! Hunted by Meagan Spooner - Hunted is a dark and twisty Beauty and the Beast retelling, and I really enjoyed it. You can read my review here. Make Me Stay by Rebecca Brooks - This romance between city girl, Samantha Kane, and injured Olympic skier, Austin Reede, is scorching hot! Wintersong by S. Jae-Jones - A fantasy world to get lost in where love and evil battle to co-exist. This one is still on my TBR pile, but I've heard the writing is beautiful! The Matchmakers of Minnow Bay by Kelly Harms - What if you thought you received an annulment, but learned ten years later, that it wasn't finalized? If you're looking for a cozy women's fiction novel, try this one. The Lion, the Witch, and the Wardrobe by C. S. Lewis - Confession - I haven't read this yet. Even Sebastian has already read it in school! I really look forward to reading this whole series soon.